Two years after its first democratic transition, The Gambia continues to face many challenges, including rebuilding national cohesion that was eroded during the Yahya Jammeh regime. Continued sociopolitical fractures risk undermining the implementation of initiatives and reforms in the National Development Plan which was launched in February 2018. After coming to power in 1994 through a coup against then president Dawda Jawara, Jammeh established a repressive regime characterised by the manipulation of communities. He gave the Jola community - of which he is a member - privileges within the state administration. Together with his repeated hostile statements against the Mandinkas, this gradually led to communities withdrawing into themselves. The Mandinkas are the community of his predecessor Jawara and his main opponent during his regime, Ousainou Darboe. Jammeh's diatribe against the Mandinkas in June 2016 swung the support of some of that community to Adama Barrow, who went on to win the 2016 presidential election. This situation exacerbated political fractures based on identities. The Jolas are currently considered important supporters of Jammeh's Alliance for Patriotic Reorientation and Construction (APRC). The Mandinkas - The Gambia's majority ethnic group - are perceived as supporting Ousainou Darboe's United Democratic Party, to which Barrow belongs. This political cleavage based on identity is more the result of manipulation than real inter-community tensions. The National Development Plan was launched following consultations between members of cabinet, civil society organisations, the private sector and several international partners. It aims to bring about good governance, revitalise the economy and ensure social cohesion and national reconciliation. 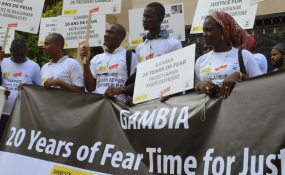 Officially established in October 2018 for a two-year term, the truth commission aims to investigate, record and make recommendations on human rights violations that occurred during the Jammeh regime. Likewise, as part of the security sector reform launched in September 2017, soldiers from the Jola community fear being targeted by the downsizing of the military which was recommended by some international partners. The ongoing Constitutional Review Commission consultations with the population also highlight the issue of citizenship - especially in reference to people from non-Gambian parents. According to the 1997 constitution, a person born in the country or abroad is presumed to be a citizen if one of their parents is Gambian. For decades the country has hosted many foreign nationals from neighbouring regions, including the Casamance in Senegal, which is predominantly Jola. The administrative requirements for issuing national identity cards imposed on some applicants of this community reinforce their sense of persecution. Some were forced to provide official evidence of their grandparents' citizenship, an additional requirement that's difficult to do and not needed by law. Tensions within the political class also hinder the implementation of the National Development Plan. First, compliance with the 2016 agreement, which provides for a transitional period of three years, divides members of the coalition that nominated Barrow for the 2016 presidential election. Barrow draws on the constitution to justify remaining in power until 2021. Some members of the coalition however demand that the 2016 agreement be respected, which would mean holding a presidential election in December 2019. Second, Barrow's desire to run for a second term would cause tension with Ousainou Darboe, the country's vice president and leader of the United Democratic Party, who also has presidential ambitions. These frictions in the executive affect the coordination needed to carry out reforms. The Gambia is at a crucial stage in its transition process. As Barrow begins his third year in office, national cohesion must remain a priority. To achieve reconciliation, civil society and government should raise awareness about the importance of inter-community dialogue and the inclusiveness of all communities. To calm tensions among politicians, a consensus on the duration of the transition must be found. It is only in a peaceful political context and with strengthened national cohesion that The Gambia can implement the reforms needed for stability, and to jumpstart its economy.